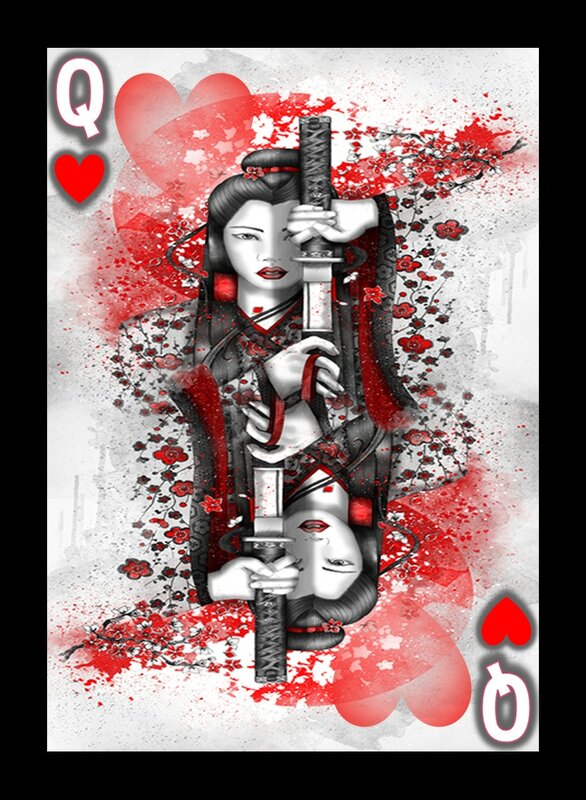 Specialising in custom designed playing cards, incorporating images from top artists around the world to create inspiring card designs. Featuring Illustrations By World Famous Artist Marine Loup! 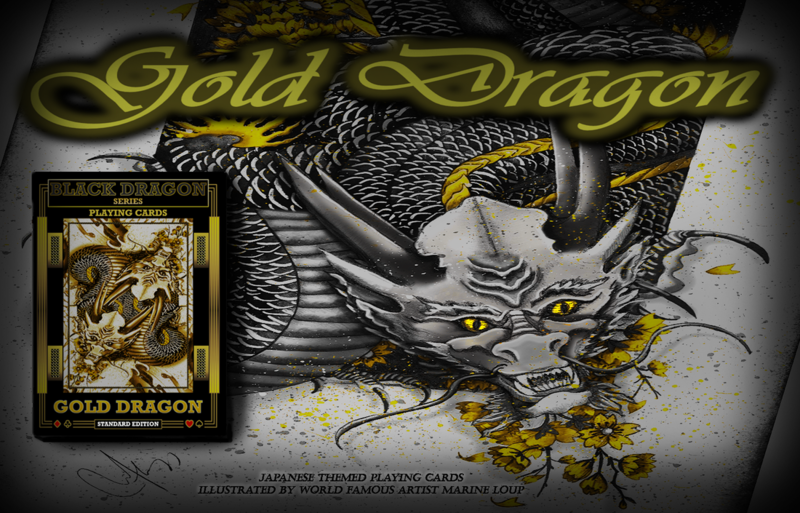 THE GOLD DRAGON (STANDARD EDITION) MAGIC TRICK DECK WILL BE IN STORE SOON! Invitation leaflet with Q Code and Password to secret magic website where you can learn some of the best kept secrets iin card magic from proffessional card magicians! 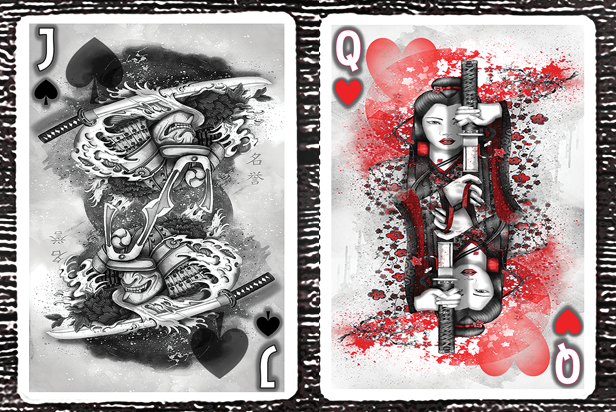 as well as being able to unlock oall the secrets to each deck in the Black Dragon Series Of Playing Cards! Join our VIP deck subscription service! AVAILABLE NOW FROM LEADING ONLINE MAGIC RETAILERS! 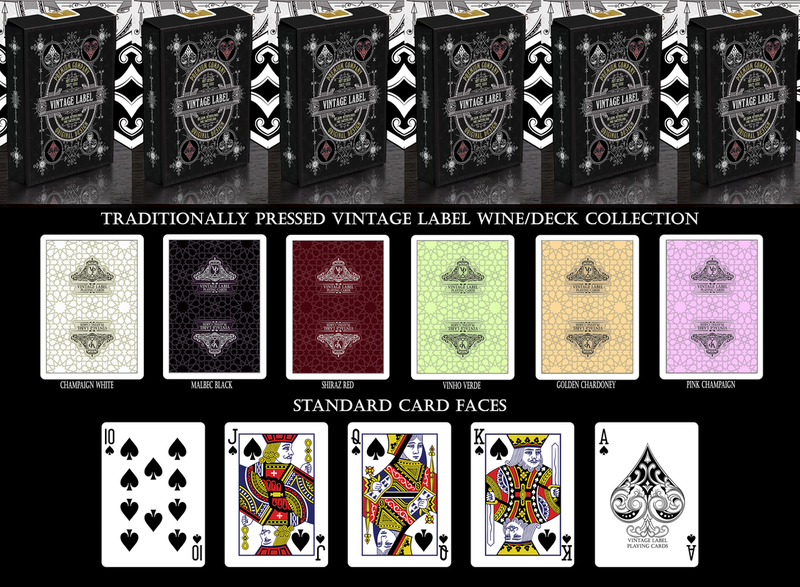 SPECIALLY DESIGNED, MARKED AND STACKED, MAGIC TRICK DECK! ​AVAILABLE NOW FROM PENGUIN MAGIC! Black Dragon Inner Circle is your gateway to unlocking the best kept secrets in card magic! 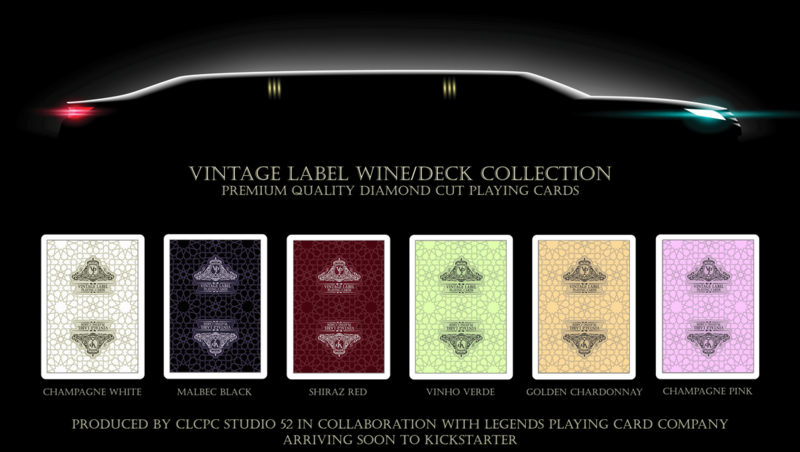 LAUNCH DAY OFFER OF FREE DECKS FOR ALL BACKERS OF THIS KICKSTARTER PROJECT WHEN IT GOES LIVE! 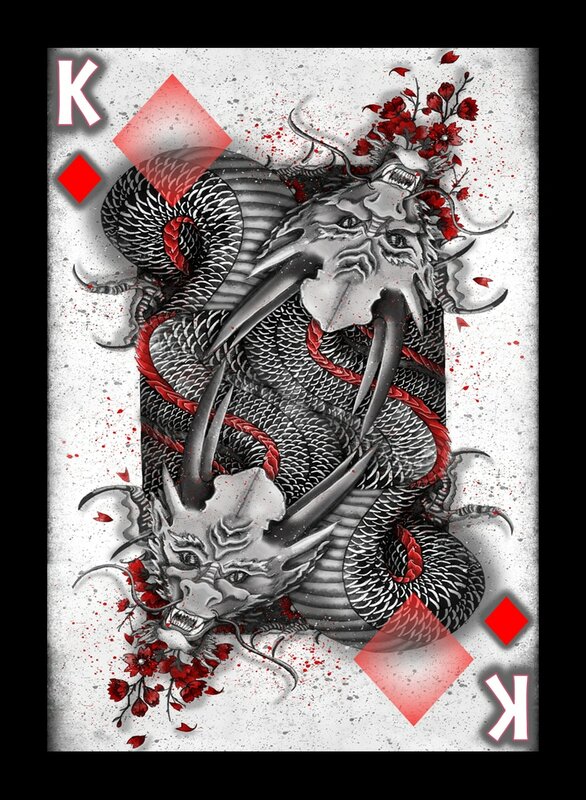 The Black Dragon Series are playing cards reimagined. From unleashed dragons to the determined black koi … these cards are made to be played, but designed to capture the imagination. 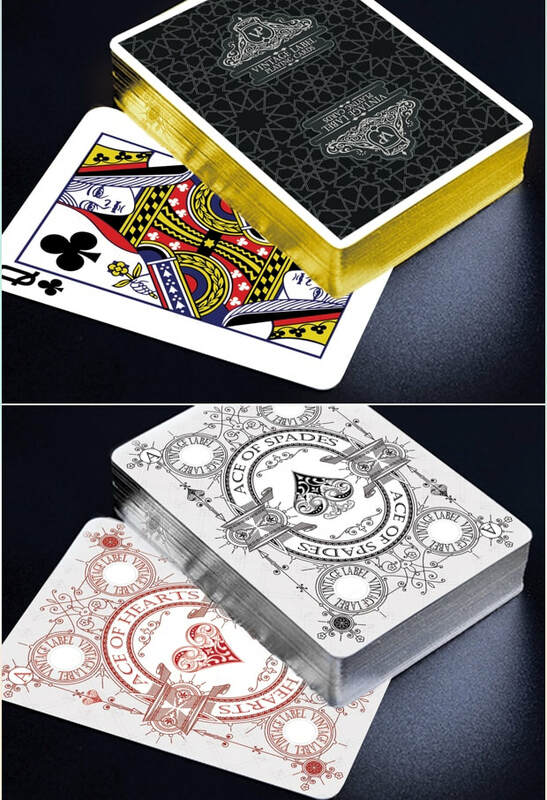 Each deck comes themed with unique images and color combinations that are coated with a special treatment making the decks ideal for sleight of hand manipulation and tricks for professional magicians. 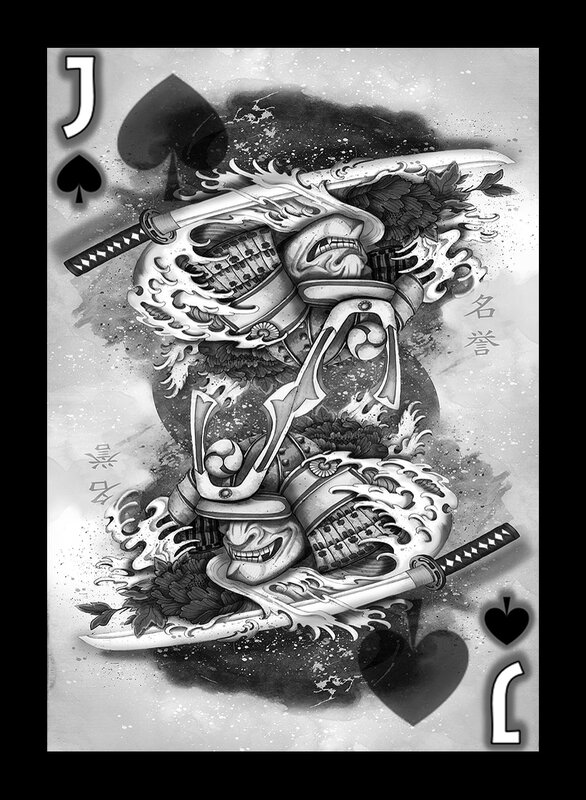 For a limited time, each Special Edition deck features signature on each joker card as well as four themed King Dragon cards, with each cards face printed in the matching color of your chosen deck style. 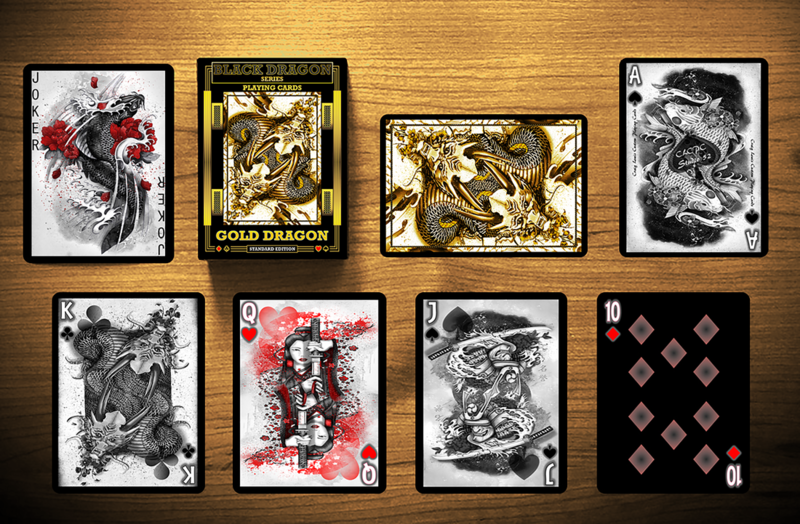 The Special Edition Gold Dragon Deck comes features signatures on four golden King Dragon cards , a golden Ace of Spades, as well as two golden Alternate Art Joker Cards. 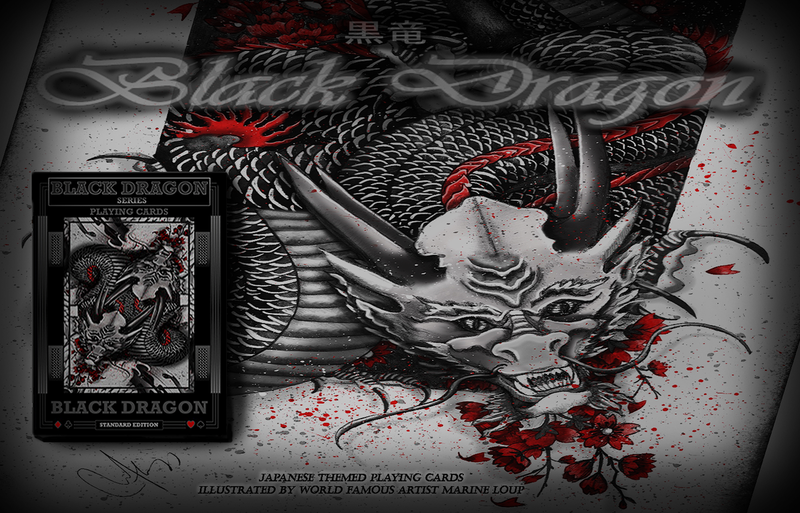 Built upon legend.....inspired by ancient tradition as well from the inspiring illustrations created by the amazingly talented artist Marine Loup, it is with great honor and pride that I am able to share with you, the 'Black Dragon Series' of playing cards, developed by CLCPC Studio 52. 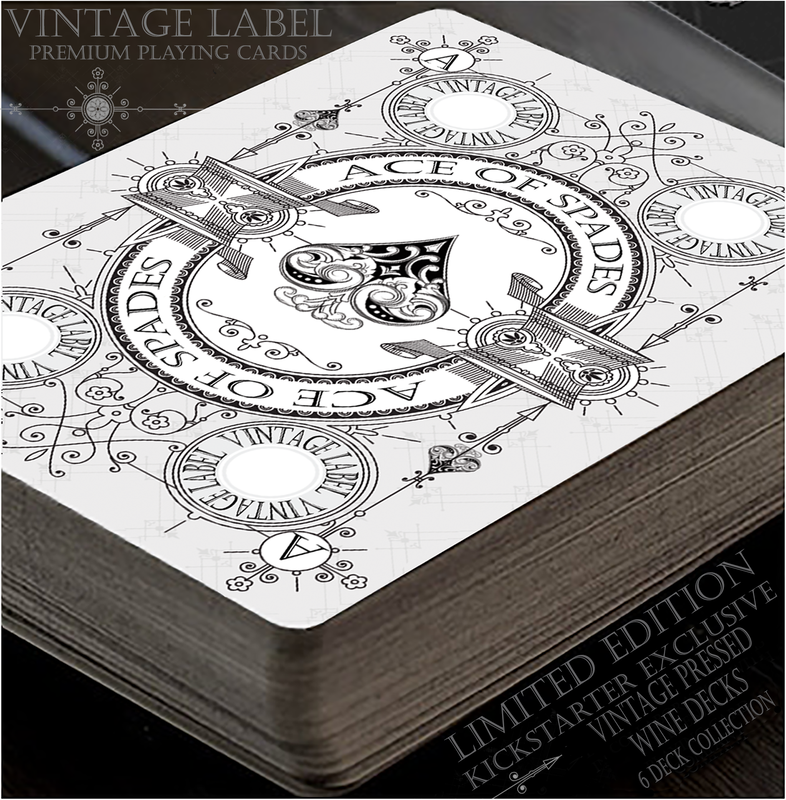 THe Black Dragon Series Of Playing Cards has just been unleashed to the world through Kickstarter and all 'unleashed' decks are now available for a limited time with a production limit of only 100 of each deck style. Perfect for card enthusiasts, cardists and street magicians. Click below to become part of the Black Dragon Inner Circle, a secret community for card enthusiasts, cardists and magicians. 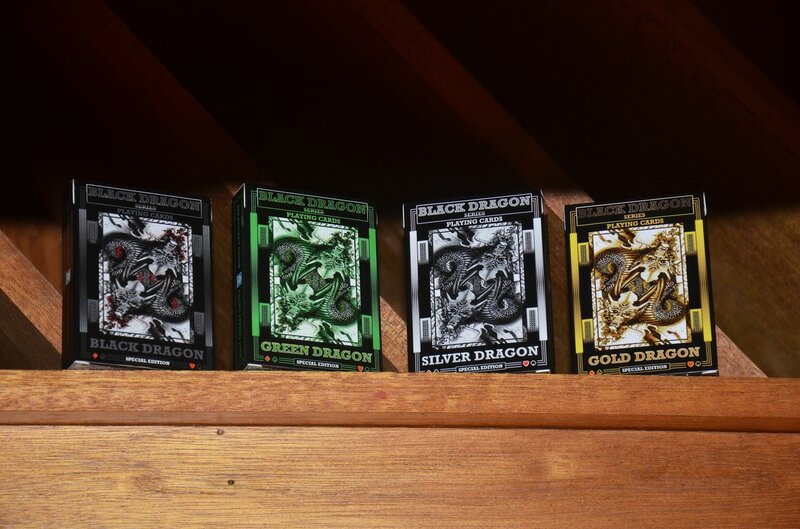 Enter to unlock all the secrets to the Black Dragon Series of Playing Cards and to unleash your inner powers. 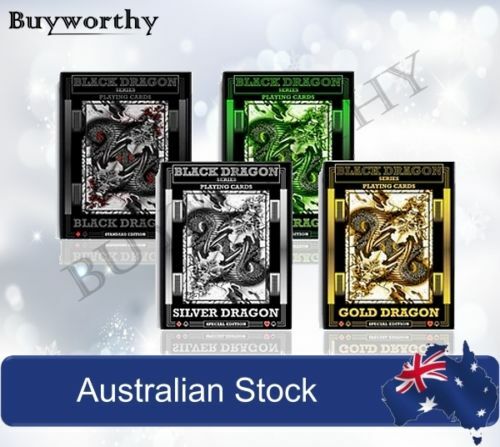 Black Dragon Series Playing Cards are premium quality cards, designed and produced to meet the needs of a broad range of card enthusiasts worldwide. 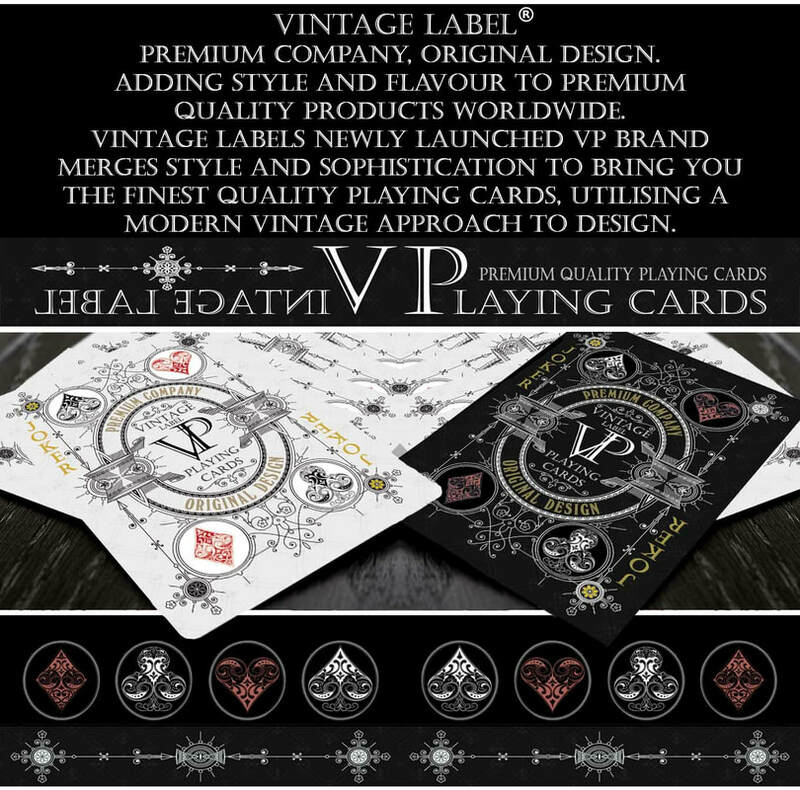 They are made from a very professional 310gsm casino paper cardstock from France, which has a linen finish with added air pockets making them more durable, better handling and more slippery due to the air pocket finish. Each card produced also contains the added quality of a black core layer center to block light shining through. 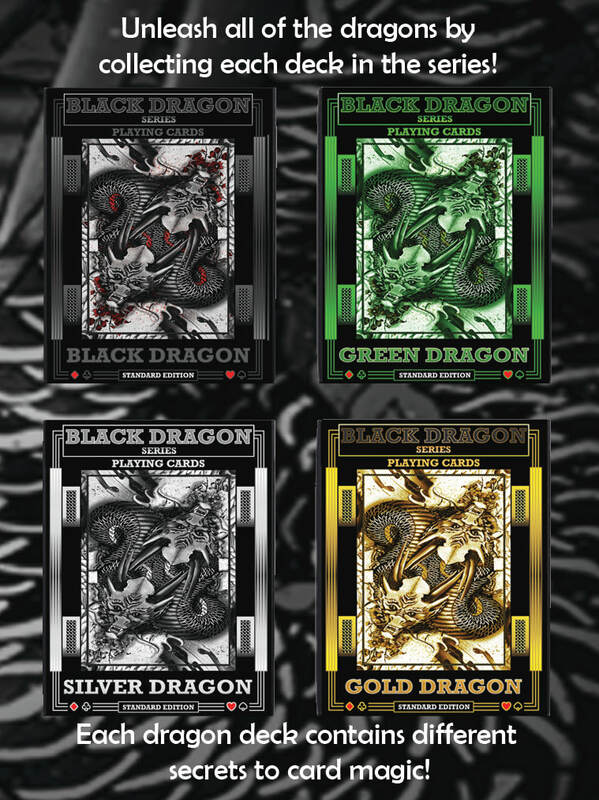 The Black Dragon series of playing cards are perfect for professionals that require top quality cards, with the superior card handling and duribility that these card provide, they are a great addition to any cardist or magicians tool kit. With the added value of featuring illustrations by Marine Loup, this deck series really stands out as a great investment for any card enthusiast and/or card collector. 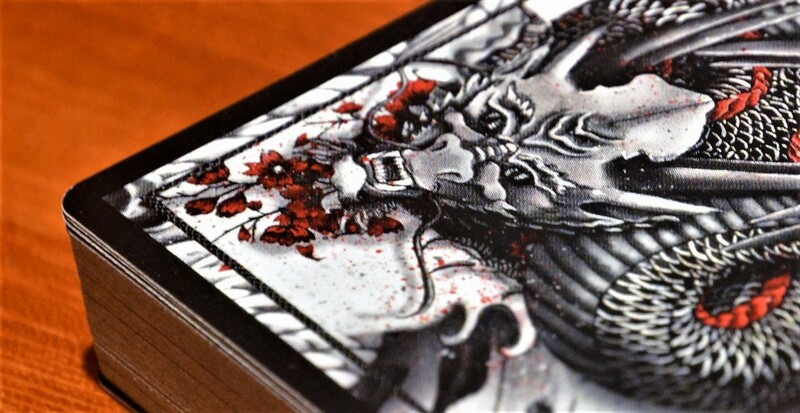 You do not want to miss out on the chance to own your very own Black Dragon Deck. All Alternate Art decks and 'Unleashed' Standard, Special and Limited Edition decks never to be repeated after this offer ends. 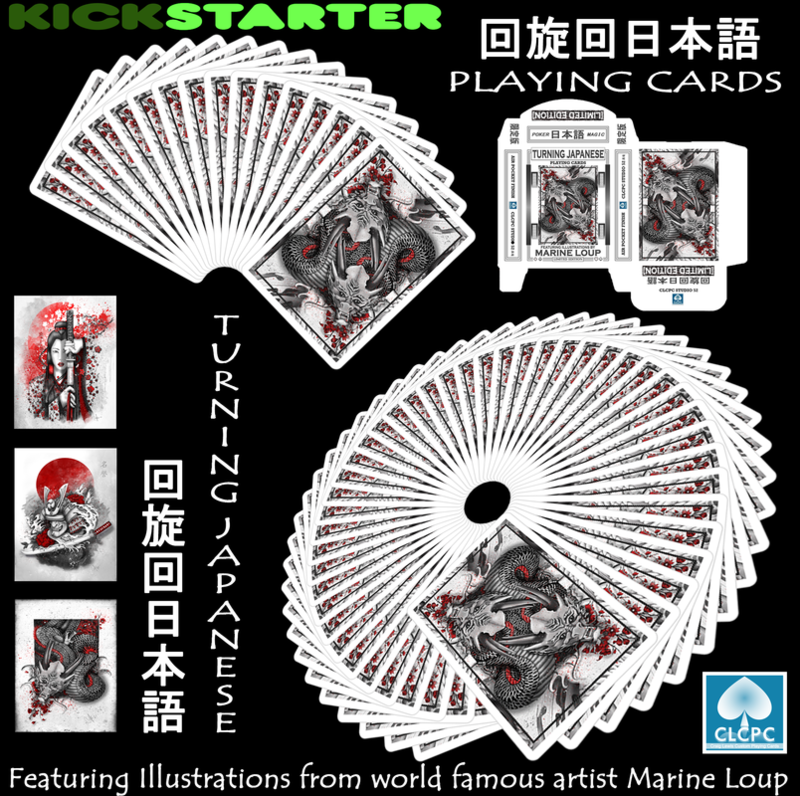 (The Black Dragon Series Playing Card Development, created by CLCPC Studio 52, has been conducted in collaboration with the amazingly talented Marine Loup, with her 'Turning Japanese' gallery of illustrations featuring as the inspirational foundation for this card project). Special thanks to Marine Loup for her contributions to the project. 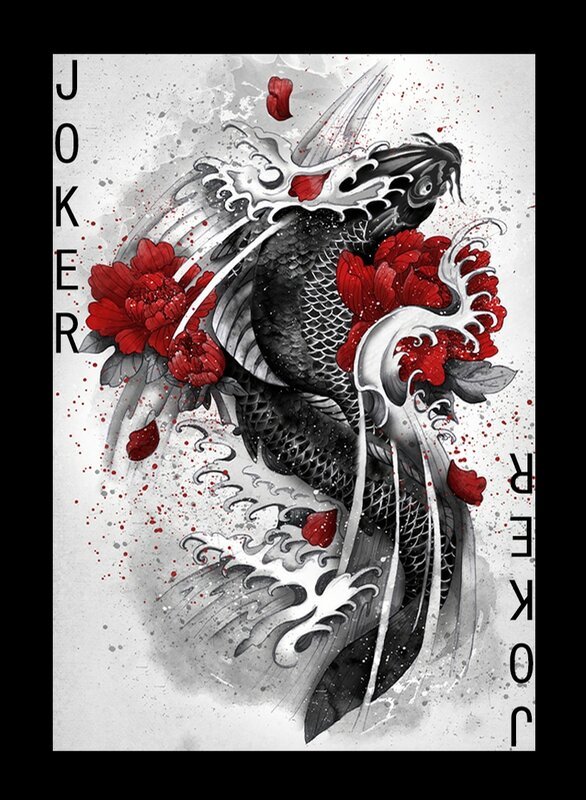 The first image to take shape, which was then eventually applied to form part of the black dragon series of playing cards, was the "Black Koi" (featured as the joker card in this deck series) which was created by Marine Loup back in 2014 after she felt inspired by a legend about a group of Koi fish. The legend goes that through determination and perseverance, a single black koi was able to swim upstream to reach the top of a waterfall against all odds, overcoming demons that laughed and mocked the koi's efforts and who had also heightened the waterfall out of malice. It goes that after reaching the top of the waterfall, the gods who had witnessed the koi's efforts, turned the black koi into a Golden Dragon, the image of power and strength. This project draws it's inspiration from this legend and from Marine Loup and her Turning Japanese illustrations, and represents the determination and perseverance demonstrated by the black koi, battling against all odds to succeed. 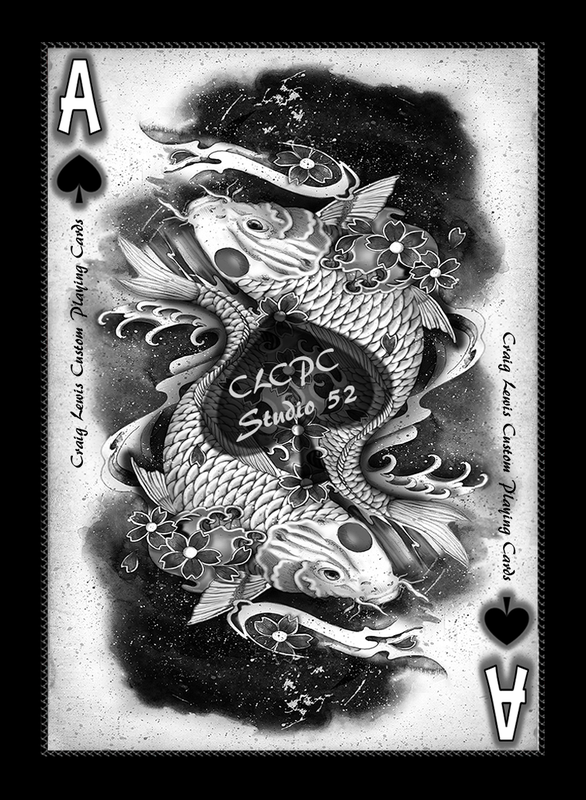 This representation has been symbolized by the black koi being featured as the joker in this deck series, to reflect the legend of how the demons had mocked and made fun of the black koi's efforts to swim upstream. 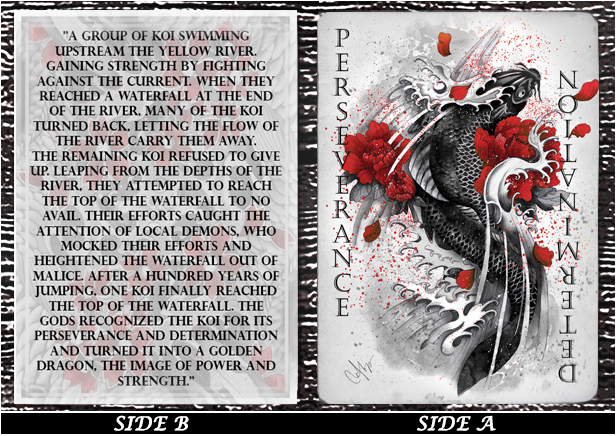 The deck series builds to the release of a Limited Edition Gold Dragon deck to symbolize the black koi reaching the top of the waterfall and will feature the black koi's transformation into a Golden Dragon. ​I was working on several other game and product developments when In February 2017, after discovering Marine Loup''s Illustrations on social media, I immediately felt inspired to start a new project, so I contacted Marine with a project proposal. After presenting my ideas to Marine, she was happy to see where it could go so I got straight to work putting together some product design concepts to share with Marine and to then build from there. 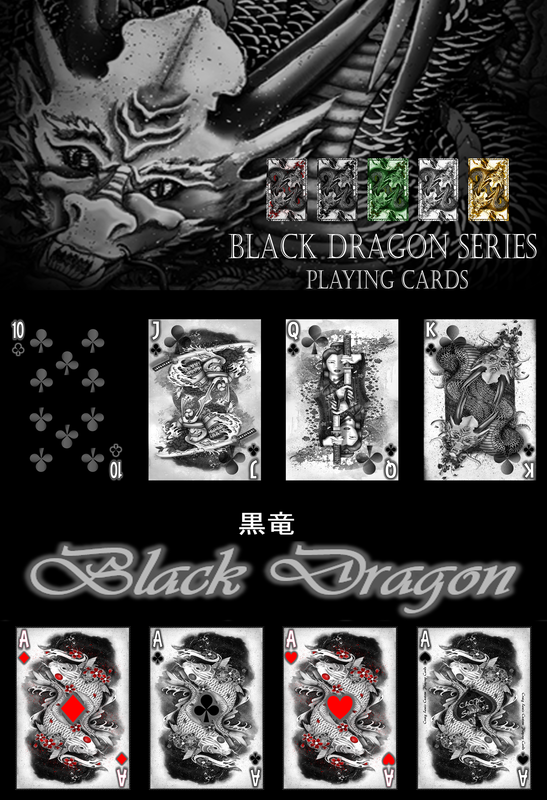 After countless hours and 4 months of designing and perfecting the final product, we are now launching the Black Dragon Series of playing cards and although this project took 4 months, technically, since the first image for this project was created by Marine back in 2014, this product has actually been 3 years in the making!. When you look at it this way, that really is a lot of time and artistic effort that has gone into eventually creating these decks of cards. Marine Loup is able to convey so much feeling and empathy into each subject matter for her artwork and there is a great sense of purpose and meaning behind each one of Marine's illustrations that has been used for this project, ones that are definitely worth drawing inspiration from.....and in knowing that, there is this certain feeling that you get when you hold one of these decks of cards in your hands .....it's pure magic! which we can then be give away to those who helped make it all happen. ​Bulk discounts and worldwide delivery! 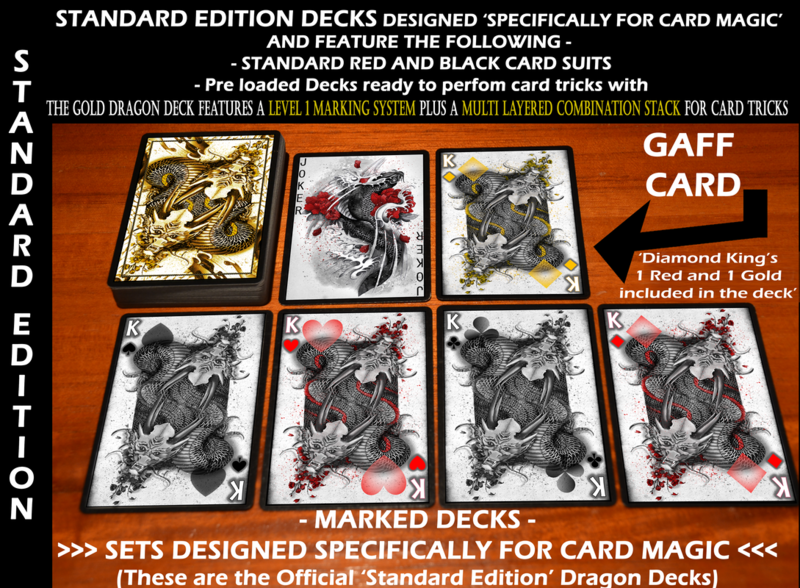 If you like, you can view the Black Dragon Series launch page where it all began as well as following us by clicking the follow button at www.kickstarter.com (to receive notifications of new deck launches on Kickstarter) To view the launch page, go to https://www.kickstarter.com/projects/754282482/black-dragon-deck-series?ref=nav_search or click the button below. 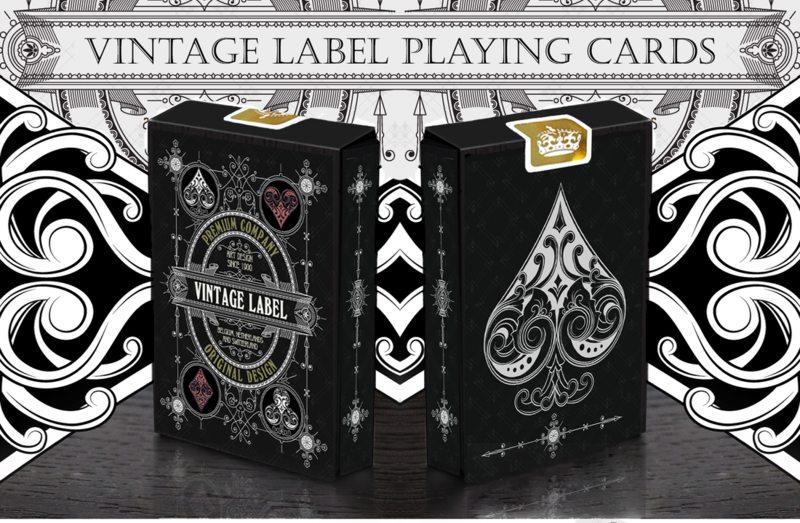 You can also head backstage to gain exclusive behind the scenes access to all of our Playing Card Projects! Click image or button below to join our free 'Backstage Pass' facebook group where you will gain full access to exclusive project content, free stuff, project updates and more....plus be notified the moment a new project launches!